The U.S. Elgin Watch Company unveiled the first electrical watch (The Elgin Grade 725) in 1952. People, at the time, were looking for something more accurate than mechanical watches and the electric watch invention created a phenomenon that lasted from that moment until the commercial success of quartz watches began in 1969. Earlier in 1950, American company, the Bulova Watch Company, decided they wanted to be a part of the wave they knew was coming so they sought and then hired, Swiss inventor, Max Hentzel to help realize their dream. Hetzel, started his career as an engineer, working in research and development at the Federal Polytechnic of Zurich, Switzerland, the Institute of Technical Physics. Hentzel would work for the Bulova Watch company for the following 9 years developing more than 20 patents in all. His work with the company began in Biel, Switzerland (current home to Rolex, Omega and The Swatch Group) Hetzel was responsible for all research on the automation problems and what was required to further improve watch performance. He believed that adding a transistor to the mechanical movement would help improve the watch’s precision. He eventually replaced the balance with a tuning fork to further improve performance. The tuning fork was asymmetrical in shape and had a small metallic piece made of two parallel arms which used a micro transistor that created electrical impulses in order to activate two coils. One of these coils had a measuring capacity which determines the amount and timing of the current pulse which typically oscillated at 360 Hz, that was a higher frequency than that of a traditional balance. (with a maximum deviation value of only two seconds per day) The copper wires of the coils were as thin as a human hair and measured almost 200 meters in length. Bulova came up with a battery that made the tuning fork vibrate. The pulse obtained divided each second into a hundred equal parts and the control of the amplitude allowed for extreme precision. The vibrations of the tuning fork were impossible to see but give off a distinct humming sound, when working. The mechanism was very small compared to a conventional watch mechanism, at that time, and was virtually invisible. On June 19, 1953, Bulova registered a patent registered under number 312290 as the first prototype of a tuning fork watch which started running and eventually became fully operational in 1954. In 1959, William O. Bennett, an American engineer working for Bulova, developed the Caliber 214, the first ever tuning fork movement. The 214 was the first wristwatch to employ a transistor, it lacked a hand-setting crown on the side of the watch, it made a strange humming sound and it was very accurate. The tuning fork had a micro-motor connected to the small side. The movements of the tuning fork were characterized by a tuning fork, a transistor and no mechanical contacts. The revolutionary Accutron watch was officially introduced on October 10, 1960 by Bulova’s president, General Omar N. Bradley. Bradley was a 5-star General of the United States Army during and after World War II. He also oversaw the U.S. military’s policy-making in the Korean War. In retirement, Bradley held a number of positions in commercial life including Chairman of the Board of the Bulova Watch Company from 1958 to 1973 being a direct liaison between upper management within the company and the current board members. of the electrodynamic transducer circuit. The 214 was initially equipped with a germanium three wire circuit, Later, 214 movements were equipped with a silicon two wire circuit. This silicon switch allowed the watch to operate up to 210°F and avoid premature cell failure. The Accutron Spaceview, with a revolutionary 214 tuning fork movement, launched in 14K gold was originally made for merchants eager to offer an eye-catcher in their displays. Unlike the standard models, the Spaceview came with an open dial that showed the tuning fork and other technical parts. The brand’s logo and indexes were printed on the inner side of the mineral glass crystal. The initial idea was to showcase the watch in the window to attract attention to passing onlookers. However, the watch was so popular that the merchants were selling the display models to avoid losing valuable business. This window model was so much in demand that Bulova quickly decided to produce it for retail. The first exhibition models that were delivered to retailers were named ‘Spaceview’ as they did not feature dials, thus revealing the details of the tuning fork movement. They began being sold in 1961. Their advertising campaign at the time praised its 99.9977% precision along with the slogan “The Watch that hums.” The watch did not feature a crown which was done deliberately to show that the Accutron had such accurate precision that it did not need to be set. It came with a leather strap and pin buckle stamped with the brand’s logo, as well. The microscopic internal index mechanism meant the tuning fork watches were characterized by a constant sweeping second hand. As popularity grew, an Accutron with a 24-hour dial was used in the capsules of the Gemini program. The Apollo spacecraft was also equipped with Accutron watches. In all, the Bulova Accutron clocks were used on the dashboard of 46 spatial missions. In 1962, the Accutron became the first certified watch for American railroads staff. Seventy-five other railroad companies across the globe also adopted the Accutron technology. In 1963, astronaut Gordon Cooper was the victim of an electric incident in his capsule during a routine mission around the Earth (known as The Faith 7 project). He used the chronometer function of his Accutron to time the restarting of the engines and was able to return to Earth. He praised the Accutron for helping to save his life. By 1965, the caliber 218, introduced in 1965, was thinner than the 214 (the case was a now a 4.4 mm thick vs the previous 5.5 mm thickness). The new version was equipped with a more traditional style crown at 4 o’clock or two crowns at 2 and 4 o’clock. The 218 was released in a range of complications not seen in the 214, including calendar functions and a jump-hour secondary timezone variant. While the 218 was a reliable, widely adopted caliber, it was never offered in a true Spaceview option, and never achieved the lasting popularity of the 214. Bulova categorized their Accutron watches by the year the model was produced through engraving done on the back of the watches. It consisted of a number and a letter: ‘M’ for the 1960s and ‘N’ for the 1970s (for example, N1 meant 1971). Eventually Quartz technology and it’s consistent accuracy along with decreased cost made the tuning fork technology begin to waver. Accutron development shifted to cheaper and smaller movements. 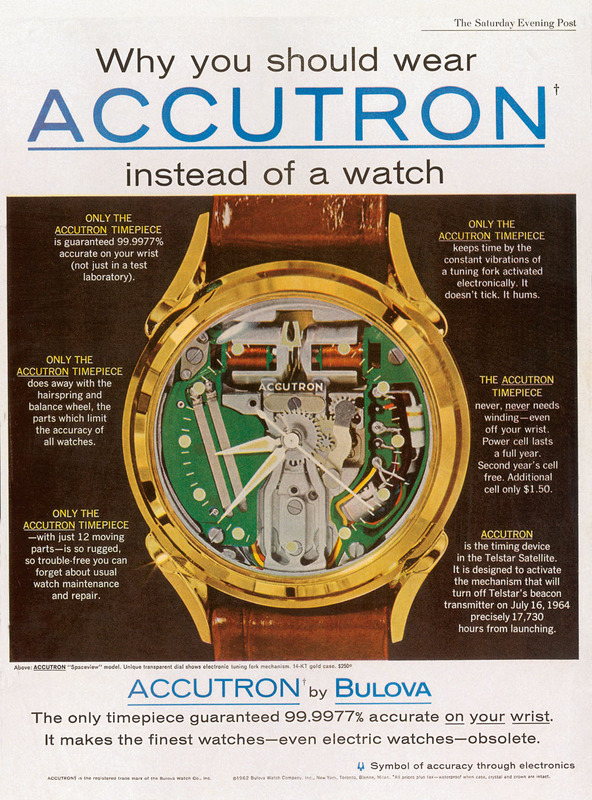 By 1976, Bulova was selling budget-priced Accutron watches with quartz movements for as low as $75. One year later, the tuning fork Accutron production was stopped altogether after more than 5 million pieces were sold. In 2002, to commemorate the 40th anniversary of the Spaceview, Bulova produced a watch with exposed internal parts that it called the Spaceview 21. The 2002 watch was discontinued after its initial run of 1,000 pieces. On the occasion of the 50th anniversary of the Accutron in 2010, Bulova produced a 1,000 limited and numbered range of the Spaceview. It was the exact replica of the 1960 model. Even though they each had retailed at $5,000 each, they were all sold before even going into production.